About 200 students and staff from St. Paul Catholic Elementary School in Lakefield were given Ontario Empire apples before crunching in sync with hundreds of thousands of students across the nation as part of the annual Big Crunch event organized by Peterborough Public Health on Thursday, March 28 in Lakefield. 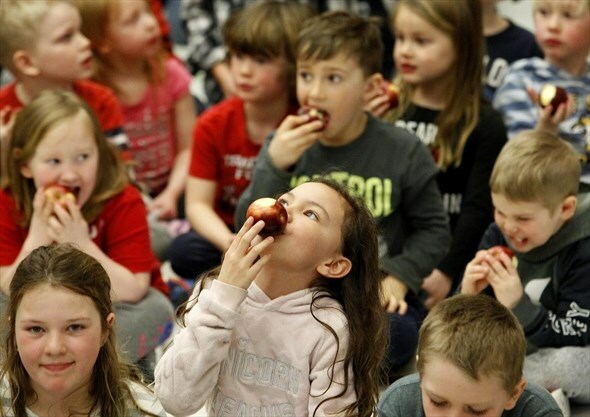 The Great Big Crunch celebrates healthy eating with a synchronized bite into locally grown apples. Angela Fuchs, Food for Kids Peterborough and County student nutrition program co-ordinator, was on hand for the festivities. “Local food is so important to our programs,” she stated. “It is good for our families and our farmers, uses less fuel to get to us, and tastes great. In 2017-18, nearly 1,000 local volunteers dedicated more than 1,000 hours a week to feed students and help them perform their best. The School Food Box, delivered to all Peterborough and County student nutrition programs, contained 15,653 pounds of Ontario-grown fresh vegetables and fruit and local cheese. Now in its fifth year, this project is made possible through donations and grants awarded to Food for Kids, including Ontario Ministry of Children, Community and Social Services, the Community Foundation of Greater Peterborough, Kiwanis Club of Scott’s Plains, Show Kids You Care, and Kawartha Credit Union. For more information, visit www.FoodforKidsPTBO.ca.